Presently, users are able to create an account without an email address. There isn't a prompt requiring or encouraging users to add their email address should they choose to skip it on desktop or mobile web. Our intention is create a prompt that changes this workflow. If a user is creating an account and they attempt to skip submitting their email address, we will then display a prompt encouraging users to supply their email address during account creation. We plan to leverage the work done in T194420 or T159837, whereby users are shown a confirmation if they try to proceed without an email address during sign up. The above option A is preferred by @RHo as it is uses OOTB components that is available for mobile and desktop users with and without JS. JTannerWMF moved this task from Inbox to Upcoming Work on the Growth-Team board. 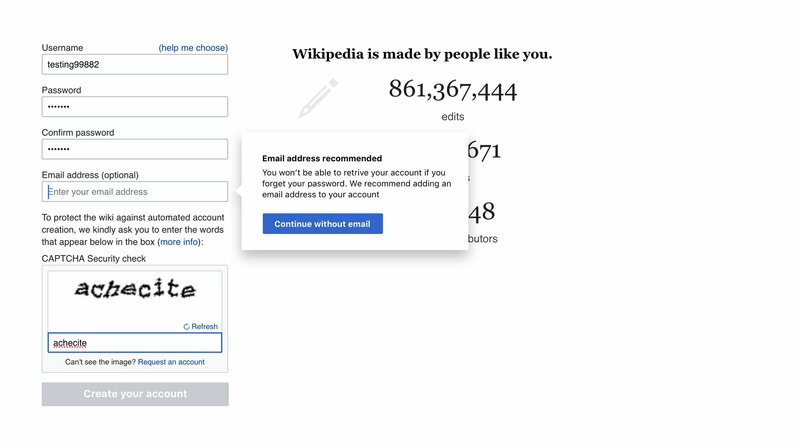 Should we add something about Privacy, which is a WIkimedia core value? We value and protect your privacy. 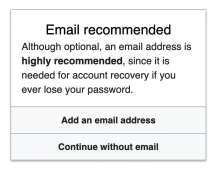 Your email address will only be used for account recovery and receiveing some notifications you choose. Tgr mentioned this in T171200: Add a configuration option to make email mandatory during account creation. An alternative with less friction is to prompt people to set (or confirm) their email address when they reach a certain level of actitity (e.g. 5 edits). That way you avoid holding up the vast majority of users who register but never make an edit. See T58028: Show Echo web notification (asking users to consider providing an email) to users who don't have an e-mail address associated with their account. To clarify: it's ok from this perspective if those other cases just don't get the prompt when proceeding with the creation. It's not ok if they can't create the account because the button isn't available. It's also not ok if people wanting to click a "Login with Google" button get tricked into clicking a button that does something different.